La Castanyada 2017 is here! La Castanyada is a custom of eating roasted chestnuts and panellets (traditional Catalan sweets) during the 1st and 2nd of November. This is a custom held deep in the hearts of Catalans since we are children. We observe this day in school years, not falling foul to the Halloween pageant and its pumpkin lanterns. 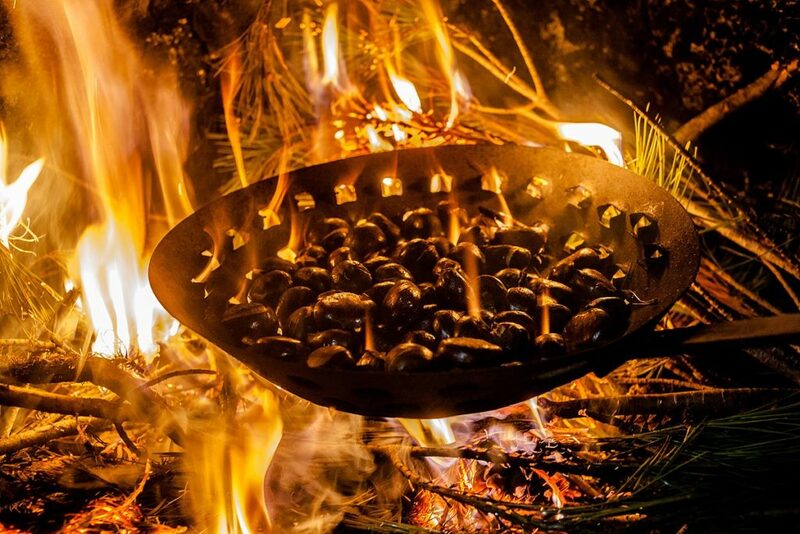 This tradition has been going for much longer and is hosted by the Castanyera – a kind of mythical good lady witch – who would sit behind her charcoal fire roasting chestnuts for everybody in her peasant rags. Some of the traditions have also been borrowed from traditional funeral offerings that have long been forgotten in the passage of time. La Castanyada 2017 is the survival of those traditions in a more modern form that pays homage to all of the Catalan Saints (1st November) and the Day of the Dead (2nd November). The first day of La Castanyada would begin with the churches beginning a non-stop ringing of bells to warn the citizens on the arrival of the time to pray for their deceased. The chestnuts are said to have been roasted for the bell-ringers who would be working all day, and that the chestnuts and sweet pieces were to replenish their strength and stave off the cold while they took turns to rest. According to some sources, the tradition became more widespread across Catalunya and other regions of Spain and Portugal during the Eighteenth Century. So if you are visiting Barcelona during this time, La Castanyada 2017 will be right on your doorstep, as virtually every street corner in the city will host a stall roasting chestnuts and sweet potatoes (moniato) for you to buy and eat right away in hot portions. 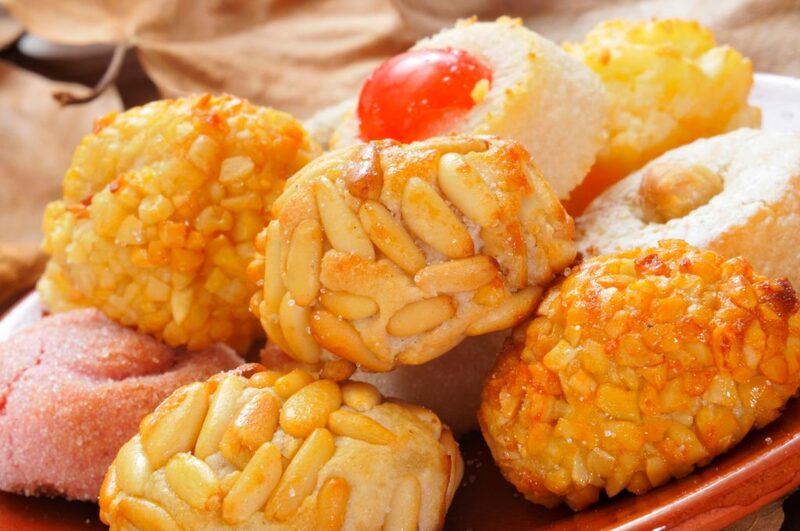 The best ones are almond-flavoured, candied fruit that are coated in pine nuts and are a typical meal for the La Castanyada 2017 celebration. The origins of this part of the tradition are somewhat lost in history, but some ideas hint that this custom is linked to the blessing of loaves, which were deposited as an offering to family tombs in honour of the memory of the ancestors and also as food in their journey to the beyond. La Castanyada 2017 with all its beautiful tasting chestnuts and sweets is actually a communion celebration to worship deceased relatives. Traditionally, while there will be many roasted chestnut vendors on the streets, it is not really a street-style festival. It’s actually a very private moment for the Catalan family as they spend time together and pay respect to their lost ones. In fact during La Castanyada, families would normally go to the cemetery and put flowers on the graves of their deceased family members and then spend the rest of the day at home, together. However, that doesn’t mean there won’t be things going on the city. Barcelona is one of the most vibrant places in Europe. If you are looking to stay here during this time, or anytime even, we have a fantastic choice of holiday rental apartments to ensure that your trip is pleasant and comfortable. Check our selection here.